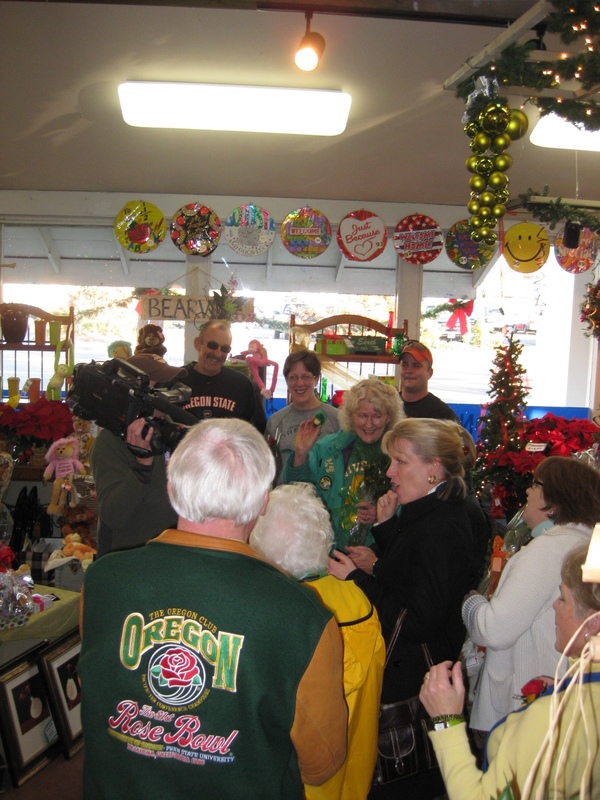 Duck and Beaver fans came in color to buy roses and patiently waited for a moment of fame with the ESPN camera rolling. Duck fans sang for the camera a rousing chorus of the Duck Fight Song with quackers going, while the Beaver fans made sure the “Go Beavers” sign was quietly waving behind them in camera view! We appreciate our fans who came out for the action. The footage will be aired during the game with other local “highlights” of team spirit. 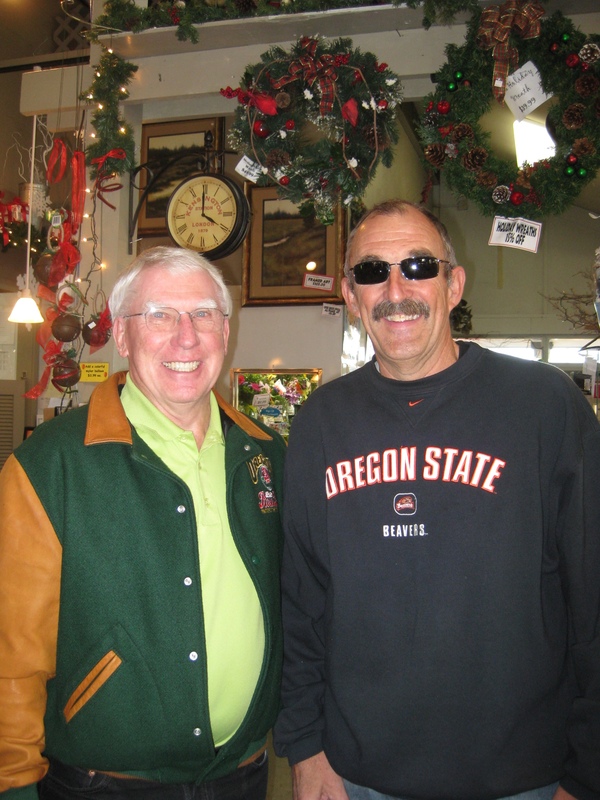 The Autzen Stadium voice of the Ducks, Don Essig and his lovely singing wife Janet were here for the action (remember….as Don says, “It never rains in Autzen Stadiuim”) and Don shared stories with Aaron Fredrickson, a great Beaver fan as we snapped their photo of the friendly rivalry. We are on to Game Day Tomorrow! So it’s time for serious game faces! Go DUCKS! We are deep in Civil War between U of Oregon and Oregon State U week. The winner of the game goes to the Rose Bowl! The city is buzzing with excitement, and fans are sending Roses to their offices and rivals! Yellow for the Ducks and Orange for the Beavers! We are making them as fast as we can! We will be selling red roses on Game Day near Autzen Stadiuim at Staff Jennings Boating Center for $2 a stem, a portion of all profits will be donated to ShelterCare! A great team, support your team to the Rosebowl, and support your community through ShelterCare. Show your Rose Bowl Spirit on national TV!